On November 30th 2018, in Sea Isle City, Makos restaurant and owner Ron Leider are profiled. Deep Blue Ahi Tuna, sesame encrusted yellow fin tuna finished with a wasabi teriyaki glaze. On November 30th 2018, in Sea Isle City, Makos restaurant and owner Ron Leider are profiled. (l-r clocktwise top) Fresh Spinach Salad with strawberries, blueberries, walnuts, and goat cheese; Romaine Heart Wedge with blue cheese crumbles, bacon, tomato, blue cheese dressing and balsami reduction; Deep Blue Ahi Tuna, sesame encrusted yellow fin tuna finished with a wasabi teriyaki glaze; a Blackened Mako with a mango chutney and topped with a crisp apple and onion salad. On November 30th 2018, in Sea Isle City, Makos restaurant and owner Ron Leider are profiled. We’re not sure why Mako’s is Sea Isle’s ‘best-kept secret,’ but that needs to change. Chef/Owner Ron Leider, above, works his magic in the kitchen of Mako’s. 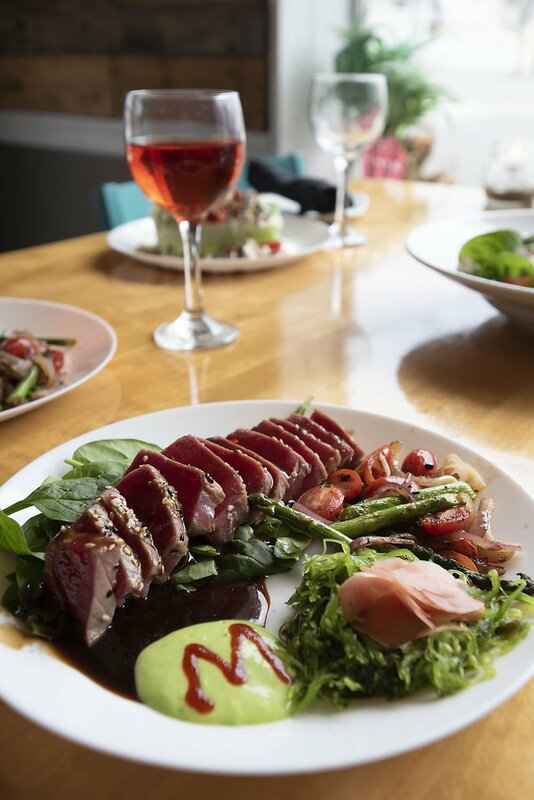 Here are a couple of the many delights he creates — pictured left, the deep blue Ahi tuna, a sesame-encrusted yellowfin tuna that’s finished with a wasabi teriyaki glaze and, on right, the house specialty blackened mako with a mango chutney and topped with a crisp apple and onion salad. The food at Mako’s is like what you’d expect at a five-star restaurant, but at a fraction of the price. On November 30th 2018, in Sea Isle City, Makos restaurant and owner Ron Leider are profiled. (l-r) Romaine Heart Wedge with blue cheese crumbles, bacon, tomato, blue cheese dressing and balsami reduction; Fresh Spinach Salad with strawberries, blueberries, walnuts, and goat cheese. On November 30th 2018, in Sea Isle City, Makos restaurant and owner Ron Leider are profiled. Ron in the kitchen. On November 30th 2018, in Sea Isle City, Makos restaurant and owner Ron Leider are profiled. Fresh Spinach Salad with strawberries, blueberries, walnuts, and goat cheese. Mako’s Restaurant has interesting breakfast and lunch items, as well as amazing dinner offerings, such as this blackened mako with a mango chutney topped with a crisp apple and onion salad. 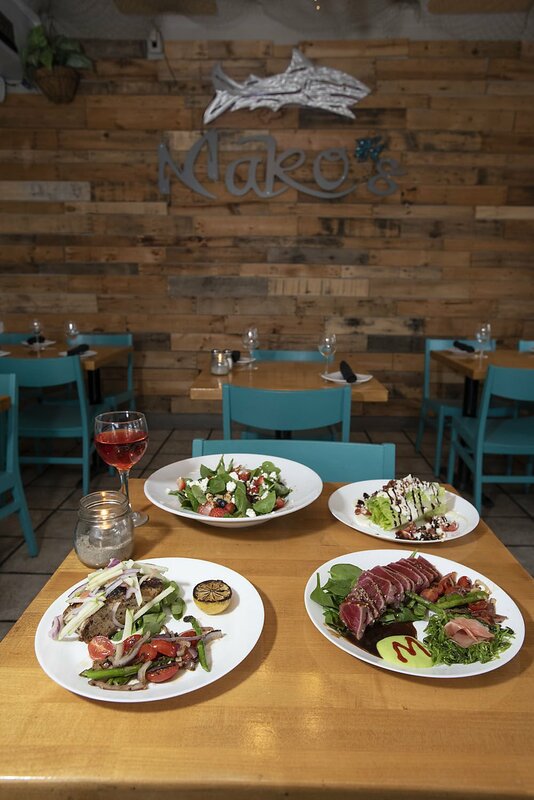 With fish nets suspended from the ceiling, a framed fish tank on the wall, sea foam blue chairs and other decorative nautical touches, you get a serene, under-the-sea feeling at Mako’s in Sea Isle — almost as if you’re floating through your entire dining experience. However, with food as good as it is here, you leave with a happy belly so full that you’re grateful to not be in the water, or you might sink straight to the ocean floor. Though the vibe at Mako’s may be cozy and chill-axing, the food — oh, that food! — is anything but. Let me tell you a little something about this blackened mako ($24). It’s out of this world. Usually I shy away from anything blackened. I find it often overwhelms whatever it is that it’s actually trying to enhance, and I wind up tasting only the “blackened” part. This is light and subtle and embellished with a mango chutney glaze. This combination is a delightful augmentation to the mako, which doesn’t need much augmenting at all. It’s thick and juicy with a crazy amount of flavor. This seriously delicious fish is meaty and substantial with a dense texture, yet somehow it can still be described as “light.” You can actually taste the freshness of it — and why wouldn’t you? It was just caught the day before from fishermen just down the road on Fish Alley. “It’s a tough fish to cook. If you overcook it, it will be dry and you won’t like it,” admits Sea Isle-native Leider of this shark dish that has gained some popularity in area restaurants, but primarily only for nightly specials and not as a menu staple like it is at Mako’s. “A lot of people haven’t had it like I cook it. It’s moist, flaky and tender. And it’s a thick piece of fish. It’s one of those dishes that’s different and separates me from the others in town. As amazing as this signature dish is, you may think it’s the reason for the restaurant’s name. It’s not. Positioned high above the front door are the jaws of a mako that at one time swam in our shores. This once-373-pound giant fish was the second-biggest mako ever caught in the state of New Jersey. It was caught by Leider’s father in 2009. Regardless, his dad was still honored by the county, which presented him with a plaque. And Leider proudly named his restaurant after his achievement. As you’d expect, apps, as well as the rest of the menu, have a distinct seafood slant, with items such as crabby bruschetta ($12), which is toasted semolina bread topped with bruschetta, parmesan and lump crab meat; sautéed mussels ($12) in a red or white wine sauce; and blackened mako medallion bites ($10) served with a cool cucumber sauce for dipping. The standout is the blackened shrimp skewer ($11). Again, the blackened flavor takes a backseat to the plump, juicy shrimp, which are accompanied by a small salad of thinly sliced apples and red onions in a sweet and tangy mango chili dressing, a combination that creates a veritable medley of intense and wonderful flavors with many yummy musical notes. Admittedly, the crispy-on-the-outside, soft-in-the-center bread is not homemade, but boy is it good. Especially when dipped into an herby olive oil and balsamic side. It also comes with marinara for dipping, but you won’t need it or want it after trying the lovely oil/vinegar dip. Salad options include standards such as a wedge and a Caesar (both $9). But go for either the Garden State ($9) or the Cranberry and Spinach salad ($9). The G.S. has everything good about our home state in it: bright greens, mozzarella, grilled asparagus, cucumbers, tomatoes and balsamic vinaigrette. The latter includes leafy spinach, dried cranberries, Granny Smith apples, blue cheese crumbles and candied walnuts. Seafood happily takes up the majority of the menu, from the colossal crab cakes with a Creole mustard aioli ($26) to the baked salmon ($25) with a sugarcane balsamic glaze to the delectable Asian ginger ahi tuna ($25) that’s seared and topped with an orange-ginger glaze. Though the menu is heavy on seafood, there are some pasta dishes like the arrabiata rosa ($25), linguini with shrimp and crab in a spicy rosa sauce, and the mouth-watering shrimp Gorgonzola ($25). It’s linguini tossed with shrimp and spinach in a light tomato cream sauce. The clincher? A drizzle of balsamic reduction on top that bolsters its flavor profile. Balsamic is something that Leider reeeeeally enjoys utilizing. Call it his secret weapon. Mako’s has been dubbed “Sea Isle’s best-kept secret.” That needs to change. Though it serves breakfast, lunch and dinner daily in season and weekends in the off-season, you should rid your brain of the word “diner” immediately. This is not your typical pancakes-and-sausage type of place. Breakfast brings items like Amaretto French toast ($9) and this wowzer — cannoli-stuffed blueberry pancakes ($9). Come lunchtime, try the “Baconator” ($9), blackened chicken, melted cheddar, bacon, lettuce and tomato on a brioche bun or “The Pleasure Ave” ($8), tomato, avocado and provolone with herbed mayo on a brioche bun. Burger options are the tried-and-true black and blue burger to the uber-pleasing — and quite a mouthful — Island Burger ($10), a 9-ounce burger with seared pineapple, a fried egg and chipotle mayo. What would this or any restaurant be without dessert? The night we went, dessert was a “trio” of chocolate mousse, regular crème brulee and pumpkin crème brulee adorably presented in a serving tray that was akin to a bento box. Speaking as someone who recently returned from Paris, both brulees were … ooo, la, la! There was a time when food this good could only be found in an ultra-expensive five-star restaurant with tuxedoed waiters and a maitre d’ with a pretentious, unpronounceable name. When: Breakfast, lunch and dinner. 10 a.m. to 10 p.m. Fridays; 8 a.m. to 10 p.m. Saturdays; 8 a.m. to 4 p.m. Sundays through Polar Bear Weekend (Feb. 16, 2019). Opens an extra day a month until April when open daily. How much: Breakfast $6-$14; Lunch $8-$13; Dinner: starters $7-$13, salads $9, entrees $22-$27. Services: All major credit cards accepted, disabled accessible, BYOB, gluten-free items, kids menu, catering, delivery, take out, live music in the summer, street parking as well as parking in the Long & Foster lot next door after 5:30 p.m. Between you and me: Mako's is hosting an intimate New Year's Eve dinner with live music. Call 609-263-3287 for more details.